Pharmaceutical companies hold the dominant position in the auto-injectors market. Major players of auto-injectors market, such as MYLAN N.V., kaléo, Inc., Amgen, Abbott Laboratories, etc., hold over 50% revenue share in the global auto-injectors market. Low competition and complex product development processes have increased the entry barriers for new entrants. High entry barriers for new entrants in auto-injectors market leads to higher product pricing. As a result, auto-injectors available in the global market are sold at premium prices as compared to their alternative -- pre-filled syringes. Evzio, an antidote for opioid overdoses was approved in U.S in 2014 with list price of US$ 575 for two packs, but has showed a shoot up in price in the last three years. Its list price is currently US$ 4,500, a direct rise of about 680%. Epi-Pen, an epinephrine auto-injectors indicated to treat allergic reaction of Mylan Pharmaceuticals, showed a price hike from $100 in 2008 to about $500 in 2016, an increase on 400%. Innovations in materials and device functions of auto-injectors are the prime factors driving the growth of the auto-injectors market. In September 2015, Bayer HealthCare launched Betaconnect- an electronic auto-injectors which is used for the treatment of relapsing-remitting multiple sclerosis (RRMS). This auto-injectors offers complete drug dosage for improved compliance and potentially reduces the overall cost. The SHL Group offers a variety of auto-injectors that can accommodate changes in injection needs, such as larger volumes, high viscosity and others. Auto-injectors manufacturers are focusing on improving the functionality of auto-injectors to improve disease management and treatment. Majority pharmaceutical companies are shifting from small molecules to biologics and vaccines, driven by increased efficacy and immunogenic of large molecules. The growth of biologics is increasing and this growth is playing a major role in defining company pipelines, acquisition strategies as well as the entry of biologics in established markets of the U.S and Europe. According to the World Health Organization, 5% of the population suffers from autoimmune diseases. Development of new drug categories may offer new knowledge and new therapeutic agents to cure diseases. About 2/3 of the new drugs to be launched in the coming years will be biologic and sustained release drugs and will push the growth of the auto-injectors in near future. Auto-injectors are preferred over conventional devices as they facilitate improved drug delivery and new formulations and thus, are increasing the demand for injectable devices. Auto-injectors enhance and improve efficiency in terms of drug delivery as they are more convenient to use. The demand for auto-injectors devices is increasing as they are designed in accordance with patient acceptance and compliance. Technological advancements are expected to make auto-injectors more user friendly and convenient to use. This is motivating patients to adopt this technology for chronic illnesses. Rising healthcare expenditure will provide significant opportunities to hospitals and auto-injectors manufacturers to adopt new advanced technologies for device development and commercialization. Previously auto-injectors manufacturers relied on the U.S Food and Drug Administration (FDA) 2009 draft guidance for Industry and current Good Manufacturing Practices for combination production. In January 2013, FDA streamlined the cGMP for combination products. Manufacturers should understand regulations and should be technologically advanced with device design innovation to establish market competitiveness. Due to availability of well-developed manufacturing infrastructure and low cost labor, multi-national companies are shifting their focus towards emerging economies, such as the Asia Pacific region. Pharmaceutical companies have their manufacturing plants in Asian countries due to easy availability of skilled labor and low cost of raw materials. The strategy used by companies in these countries includes increasing revenue and at the same time, expanding business geographically by marketing products in. Also, auto-injectors companies are entering into collaborations with other companies to manufacture more advanced and innovative products by sharing their organic resource. In September 2016, Aptar Pharma formed an agreement with Becton, Dickinson & Co. to develop auto-injectors devices to be used safely and conveniently by patients. The two-step auto-injectors will be exclusively sold by Becton, Dickinson & Co. In December 2016, SMC Ltd. acquired Oval Medical Technologies Ltd., developing next generation auto-injectors to enhance its product portfolio and to expand drug delivery capabilities. For more such actionable insights on the potential of auto-injectors market, request a free sample copy. The competition section of the auto-injectors market features profiles of key players operating in the industry based on their auto-injectors market shares, product offerings, differential channel strategies, marketing initiatives, product reach and company dashboard. Some of the key players featured in the auto-injectors market report include Sanofi, Pfizer, Inc., Becton, Dickinson and Company, Mylan N.V., Novartis AG, Janssen Global Services, LLC, Antares Pharma, Amgen Inc. Bayer AG, & Eli Lilly and Company. The key manufacturers of auto-injectors are focusing on novel marketing strategies to increase their product reach. Companies are conducting awareness campaigns to increase their product usage. Price reduction by branded auto-injectors is leading to head-to-head competition in the market. These companies are rebranding their auto-injectors products with lucrative discounts. Conventional distribution channels, such as retail pharmacies, drug stores, etc. would be the key target channels for product distribution. Auto-injectors devices are new injectable with a user-centric design approach that automatically inject a needle and perform the surgical procedure, thereby reducing dependence on healthcare professionals. These are specialized instruments that can be used to avoid needle stick injury and reduce needle phobia among patients. These are revolutionary instruments which have been invented to ensure complete dosage with painless drug delivery. FMI conducted a research study on auto-injectors market for the forecast period 2016 to 2026. The report offers a comprehensive evaluation of the business opportunities prevailing in the auto-injectors market along with insights on the consumption trend, dynamics, incidence, patient awareness level, pricing analysis and market competition. The report elaborates on the macroeconomic factors influencing the dynamics of auto-injectors market and its futuristic potential. The report offers a comprehensive taxonomy of auto-injectors market based on product type, indication, distribution channel and region. Auto-injectors are of two types: Prefilled Auto-injectors & Fillable auto-injectors. These auto-injectors are distributed through various sales channel. Traditional sales channels, such as hospital pharmacies and retail pharmacies, are the primary point of contact for the sales. The auto-injectors market has been analyzed across regions of North America, Latin America, Europe, Asia Pacific Excluding Japan, Japan and MEA. What is the revenue potential of generic auto-injectors across regions of North America and Europe? Who are the key competitors and what are their portfolios in auto-injectors market? What is the price point for generic auto-injectors manufacturers in developed countries? How interventions from regulatory authorities and insurance service providers are shaping Auto-injectors market growth? For answers to all possible questions required for gauging performance of auto-injectors market, get in touch with our expert analyst. FMI has analyzed the market size of Auto-injectors market using the triangulation methodology. We tracked the revenue of key players operating in this segment. Key Players have been segmented at a Tier-level with respect to their revenues, product portfolio and geographical presence. This process involved analysis of various company investors’ presentations, SEC filings, annual reports, earning call transcripts, 10k reports and press releases. This task was done to fetch substantial information about the key players, their respective revenues and estimate their respective auto-injectors market share. The recent market study published by FMI– “Auto-injector Market: Global Industry Analysis 2012-2016 & Opportunity Assessment, 2016-2026” -- provides a comprehensive assessment of the most important market dynamics in the auto injector market. Growth prospects for the auto injector market have been obtained with maximum precision by conducting a thorough research on historic as well as current growth parameters in the Auto Injector market. The report covers unique and salient factors that may make a huge impact on the development of the Auto-injector market during the forecast period. The report will help market players to modify their manufacturing and marketing strategies to envisage maximum growth in the Auto Injector market in the upcoming years. The report provides detailed information about the current and future growth prospects in the Auto-injector market in the most comprehensive way for the better understanding of readers. The report commences with the executive summary of the Auto-injector market report, which includes a summary of key findings and key statistics of the market. It also includes the market value (US$ million) estimates for the leading segments of the Auto-injector market. Readers can find detailed taxonomy and the definition of the Auto Injector market in this chapter. This chapter will help readers to understand the basic information about the Auto Injector market dynamics, trends, forecast factors, PEST analysis and regulatory scenario included in the report. Based on the product type, the Auto-injector market is segmented into pre-filled auto injectors and fillable auto injectors. In this chapter, readers can find information about key trends and developments in the Auto-injector market and market attractive analysis based on the type of auto injectors. 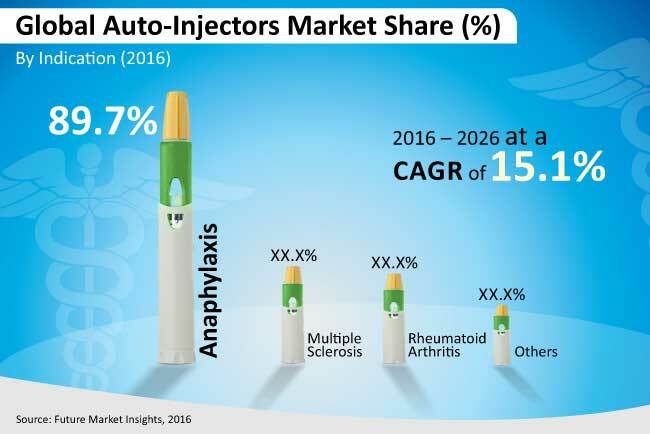 Based on Indication, the Auto-injector market is segmented into Anaphylaxis, Multiple Sclerosis, Rheumatoid Arthritis and other. In this chapter, readers can find information about key trends and developments in the Auto injector market and market attractive analysis based on the Indication for each region. Based on distribution channel, the Auto-injector market is segmented into hospital pharmacies, retail pharmacies, online pharmacies and drug stores. In this chapter, readers can find information about key trends and developments in the Auto-injector market and market attractive analysis based on distribution Channel for each region. This chapter explains how the Auto-injector market will grow across various geographic regions, such as North America, Latin America, Western Europe, Eastern Europe, Asia-Pacific Excluding Japan (APEJ), Japan and the Middle East & Africa (MEA). This chapter includes detailed analysis of the growth of the North America Auto-injector market along with country-wise assessment, including for the U.S. and Canada. Readers can also find regional trends and regulations and information on market growth based on product type, indication, distribution channel and country of auto injectors in the North American region. Readers can find detailed information about factors, such as pricing analysis and regional trends, which are impacting the growth of the Latin America Auto-injector market. This chapter also sheds light on growth prospects of the Auto-injector market in leading LATAM countries, such as Brazil, Mexico, Argentina and rest of the Latin American regions. Growth prospect for the Auto injector market based on product type, indication and distribution channel in several European countries, such as Germany, France, Italy, Spain, UK, BENELUX, and Rest of Western Europe, has been discussed in this chapter. Growth prospect for the Auto-injector market based on product type, indication and distribution channel in several European countries, such as Russia, Poland, and Rest of Eastern Europe, has been discussed in this chapter. Great China, India, ASEAN, Australia and New Zealand are the leading countries in the APEJ region and are the prime subject of assessment in this chapter. Readers can find thorough information about the growth parameters in the APEJ Auto-injector market in this chapter. Readers can find information on important factors that can make a huge impact on the growth of the Auto-injector market in Japan during the forecast period. This chapter provides an overview of regulations, drivers, restraints and trends in the Japan Auto Injector market. This chapter provides information on how the Auto injector market will grow in the major countries of the MEA region, such as GCC Countries and South Africa, during the forecast period. In this chapter, readers can find a comprehensive list of all the leading stakeholders in the Auto-injector market and detailed information about important companies, including company overview, revenue share, strategic overview and recent company developments. Market players featured in the report include Sanofi, Pfizer, Inc., Amgen Inc., Bayer AG, Janssen Global Services, LLC, Mylan N.V., Novartis AG, Antares Pharma, Inc. and Eli Lilly and Company. This chapter will help readers to understand the research methodology followed to obtain various conclusions, important qualitative information and quantitative information about the Auto Injector market. Regulations of Auto Injectors – U.S.